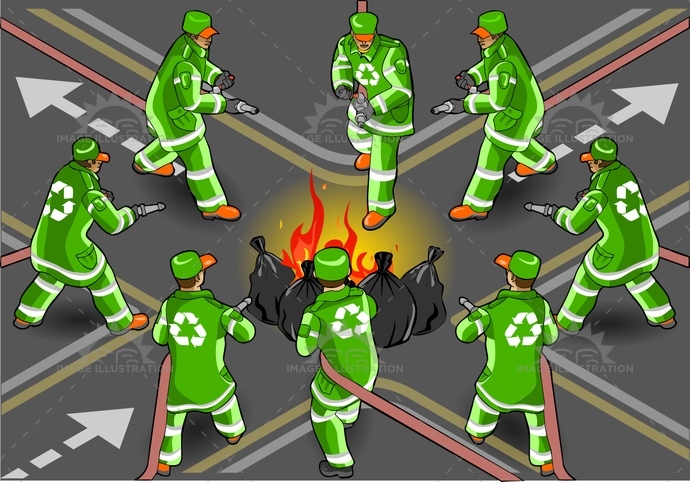 Stock product - detailed vector illustration - Isometric People Collection - Garbage Man 02 - created by Aurielaki. Image formats EPS AI JPG. SKU: Garbage-Man-02-People-Isometric-AurielAki. Category: Isometric Blue Collar People. Tags: boots, cleanliness, concept, dirt, ecology, fire, Garbage, Garbagebag, garbageman, green, hatwithvisor, isolated, isometric, plastic, pollution, recyclingsymbol, reflector, Rubbergloves, rubbishbin, sleeve, uniform, vector, washing, waste, work.